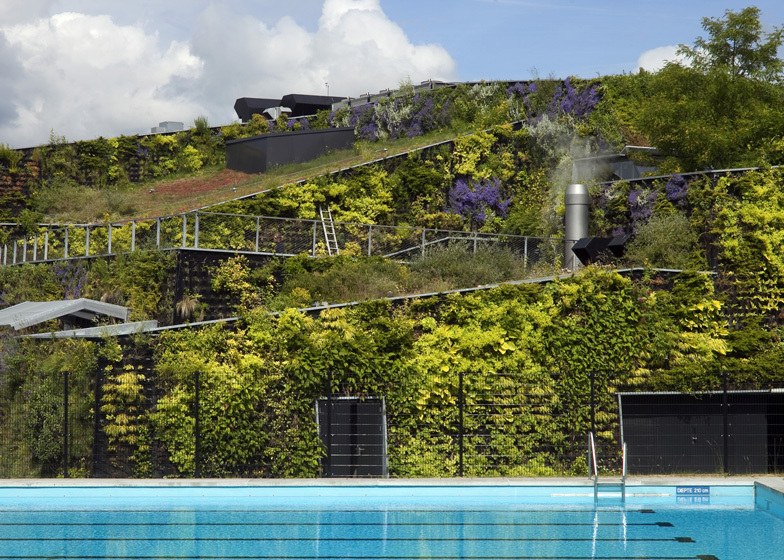 This leisure centre in Amsterdam by Dutch architects VenhoevenCS was designed as a fortress covered in plants (+ slideshow). 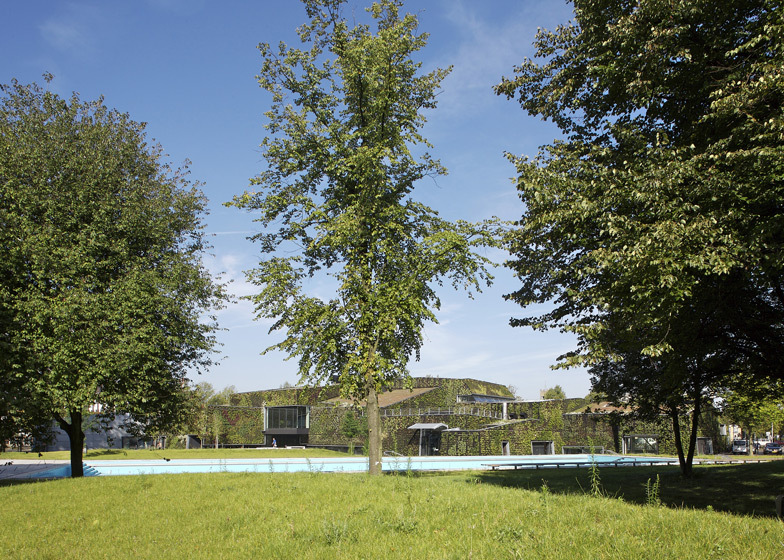 SportPlaza Mercator is positioned at the entrance to a park in the De Baarsjes neighbourhood. 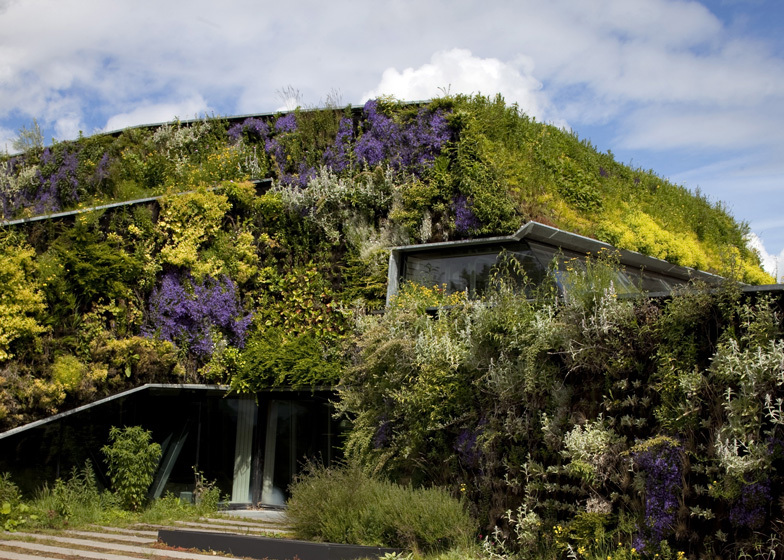 The architects wanted it to fit in with its surroundings, so they added a camouflaging facade of bushy plants and flowers. 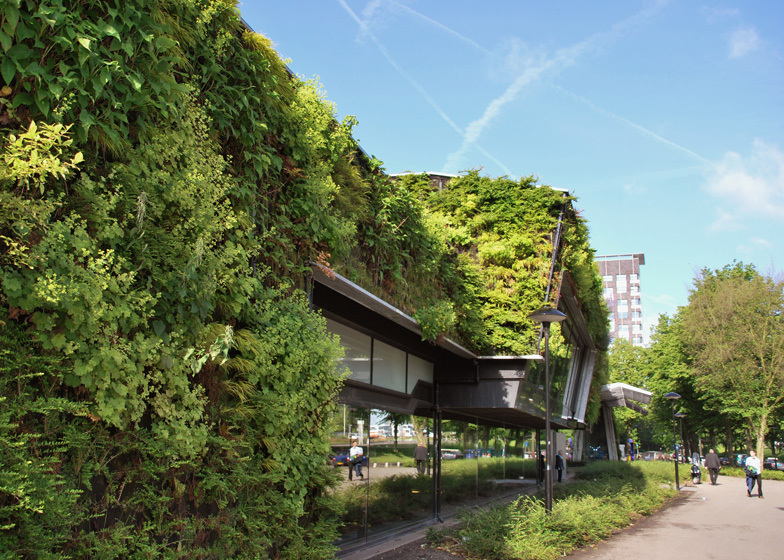 "Because the building was constructed in a park we wanted to preserve as much as possible, we completely covered it in vegetation, camouflaging its diverse program," explains VenhoevenCS. "From a distance, it seems like an overgrown fortress flanking and protecting the entryway to the nineteenth century city." 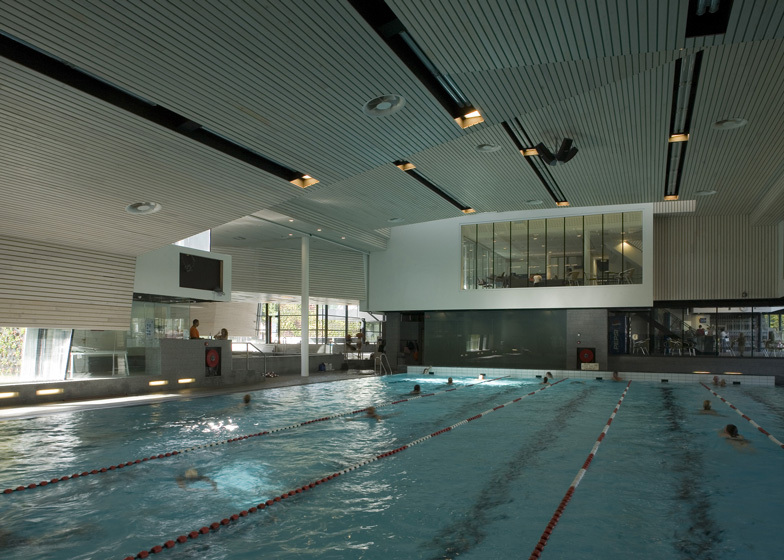 Behind the planted walls, the three-storey building contains swimming pools, a sauna and fitness studios, as well as an events hall, a fast-food restaurant, a cafe and a nursery. An outdoor pool is also included at the rear. Windows nestle in amongst the planted exterior but feature tinted glass to reduce visibility into the swimming-pool halls. Skylights were also added to bring in more natural light. 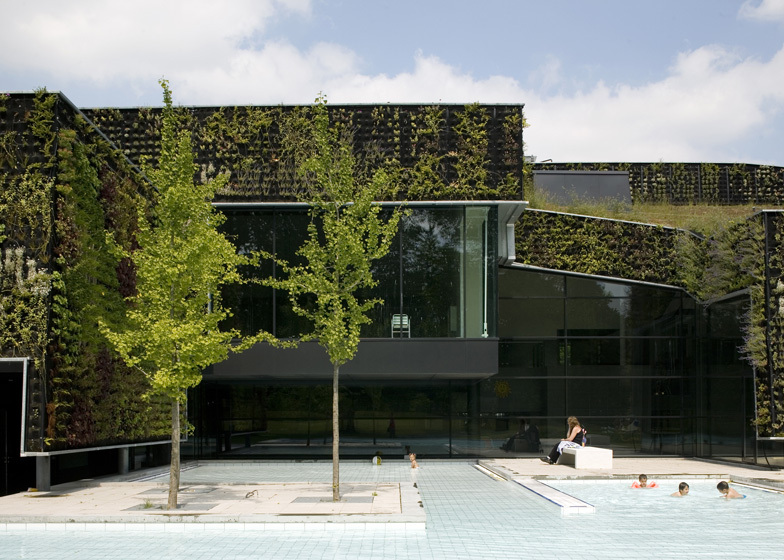 The building was completed in 2006 but recently picked up a nomination for the inaugural Green Building Award, organised by Dak & Gevel Groen magazine in the Netherlands. Other buildings we've featured with planted facades include a townhouse in Portugal, an office building in France and a pharmacy in Japan. See more green walls on Dezeen. Amsterdam's 'De Baarsjes' is a multicultural neighbourhood that is home to people from 129 different countries. The city district wanted to boost community life in this area. 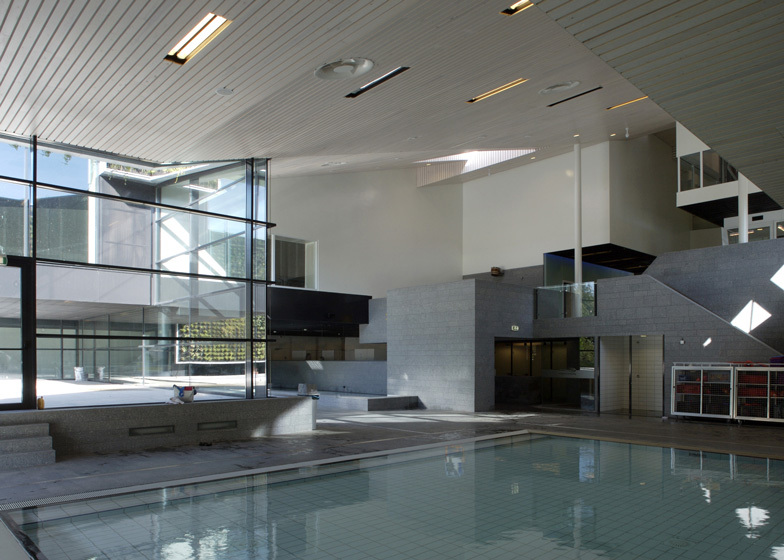 The authorities therefore opted for a building which combines swimming pools, a therapy pool, fitness, aerobics, a sauna and steam bath, a party centre, café and childcare alongside a fast food restaurant. Each individual element attracts different target groups, so the entire population will be able to use it in the end. Inside, everyone can see other activities, intriguing their interest and inspiring them to use other facilities as well. Because the building was constructed in a park we wanted to preserve as much as possible, we completely covered it in vegetation, camouflaging its diverse program. The building was designed as a city – a society in miniature – inside a cave. The building is full of lines of sight and keyholes that offer perspectives on the various visitors, activities and cultures in the building. Sunlight penetrates deep into the building's interior through all sorts of openings in the roof. Low windows frame the view of the street and the sun terrace.